Its been a while since I've done a proper Long Slow Run. The run at the end of the 70.3 was an LSR by default and doesn't count. Again it's all to program where possible. Forecast was 12.90km in 01:35:00 costing an approximate 1050kcal. What is the purpose of the LSR? The benefits of LSR are building basic endurance by running a long distance. In the beginning of the long run, the intensity target is zone 2. In the beginner and moderate levels, zone 3 is included towards the end of the session. Running in zone 2 builds endurance by developing fat oxidation capability. Running in zone 3 in the end of the session (included in the beginner and moderate levels) also builds up resistance to fatigue in marathon speed. With this in mind I deliberately set out with a 20k loop in mind. 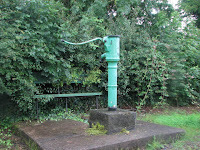 Knowing that I would be half way round before my brain had caught up and it would be as far to go on as to go back. 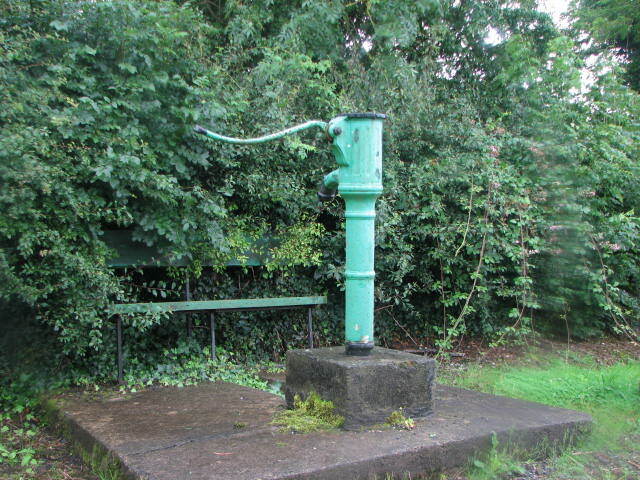 I did hydrate, but didn't bring water with me, knowing that there would be opportunity to get water at a tap in a garage or at one of the old fashioned pump station in one of the villages on the way round. I tucked a gel and my phone in a Shadowpak and went out the door. There had been a lot of rain overnight so the ground was pretty wet with plenty of puddles to dodge. It's all about keeping steady so a 10min Warm up (Zone 2) is followed by 80mins in Zone 2 and a 5min Cool-down. I was reckoning on adding 6 or 7km on the end of the LSR as 'punishment'. We had our club meal in Basilico on Saturday night so after a few Peroni beers, some red wine, a nice meal and great company there was a 'contract' passed around encouraging us to sign up to a commitment to do Challenge Barcelona at the end of 2012. I won't bore you too much with the detail of the run, it was fine. A couple of showers, a couple of near misses with cars & puddles (I know who you are, Mr. Audi) a few km of efforts and I was back home. All in all, 19/20km covered in 2 hours. I need to calibrate my foot pod correctly. In review, the heart rate is slightly higher than expected but probably due to tiredness, slight dehydration towards the end and some cardiac drift in the readings. 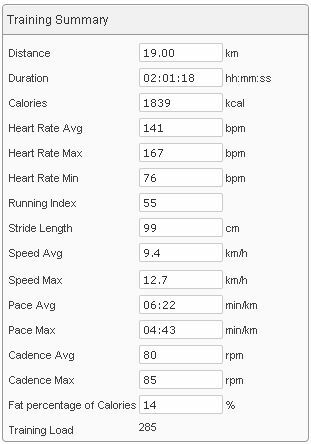 I will need to aim for a higher average pace to achieve a targeted marathon finish time but this is all HR training, the speed comes in Tempo and Interval sessions. Time for a shower, change and off to see Dublin bring Sam home!